India might have turned into the third-biggest startup eco-system, yet it needs innovative advancements. Firstly, existing & aspiring entrepreneurs need to understand the meaning of entrepreneurship. There is a thin line between entrepreneurship & business, let me break that to make thoughts clear on it. A Businessman strolls on the specified path, however an entrepreneur works to make his own way, which turns into a guideline for other businessmen. The vast majority have a confusion that the terms entrepreneur and businessman convey a similar significance, because of which they utilize them reciprocally. A businessman is a person who manages selling of goods or services, undertaking a predictable business thought into an existing market. On the contrary, an entrepreneur is somebody who initiate working on an idea to solve some problem with innovation for the mass. Monetization or commercialization of that idea or solution is the way to survive in the market leading to a business segment inside entrepreneurship. Meaning A businessman is someone who sets up a business with an existing idea offering products and services to the customers. An entrepreneur is a person who starts an enterprise with a new idea or concept, undertaking commercial activities. Entrepreneurs are known for their inventive approach. They bring development and facilitate the assets. They act as a soldier who are fighting within the boundaries to save country’s economy by providing employbality to mass. They also bring business opportunities to other businessmen who can now follow their path in a market created by entrepreneurs. In business, there is tough competition because there are many of rivals already existing in the market undertaking the same business which was once started by some entrepreneur. Although the risk factor is low because he walks on a path that is already tested by the rivals so the chances of failure are relatively low if done properly. While in entrepreneurship, one who lead the market always will be a leader no matter how many competitors will come later, but their position will remain kept untouched. Steve Jobs (Apple), Bill Gates (Microsoft), Zeff Bezos(Amazon), Mark Zuckerberg (Facebook), Larry Page (Google), Sachin Bansal (Flipkart), Vijay Rajsekhar(Paytm), etc are few entrepreneurs who have shown path to many other entrepreneurs, aspiring entrepreneurs & businessmen as well. 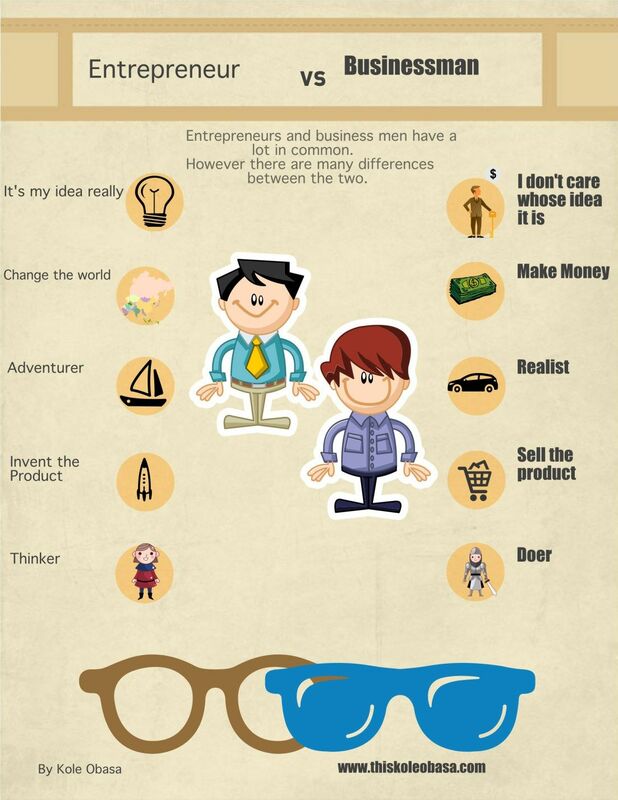 Hope above post will help you to get a clear differentaistion between entrepreneurship & business. Please add your views & thoughts in comment section, also if something has been missed in this article.